Last month we have done some initial GeForce GTX 980 crypto mining benchmarks with the announcement of the new Maxwell GPUs from Nvidia. Now we got our hands on a Gigabyte GeForce GTX 970 G1 Gaming video card (GV-N970G1 GAMING-4GD ) and have decided to run some tests to see how well it will fare against a standard reference design GTX 980 again from Gigabyte (GV-N980D5-4GD-B). The reference design GTX 980 we’ve used is running at stock frequencies, including the boost one and the results below are with the card not additionally overclocked, even though it can take quite an increase in the frequency. The Gigabyte GeForce GTX 970 G1 Gaming card however is factory overclocked to a really high frequencies as compared to the stock ones and there is not that much left for the user to add, though some extra overclocking is also possible. The G1 Gaming card from Gigabyte also comes with the company’s Windforce cooler that proved to be a very good and silent cooling solution even when you overclock. Also the GTX 970 model is with a factory increased max TDP level to go along with the overclock the 100% of the power limit actually represents 250W instead of 145W or 165W. This leaves a lot of headroom for more power hungry crypto mining algorithms, even though in our tests not a single algorithm was able to hit 100%. The closes we got was about 90% of the increased TDP reached with the groestl algorithm most others were keeping in the 60-70% of the 250W TDP limit. 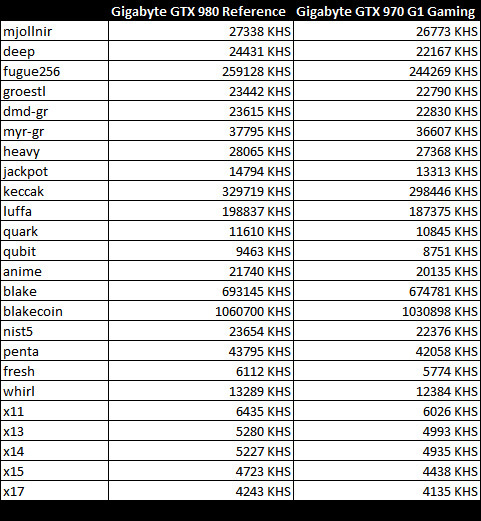 The results you can see in the table above are achieved with the ccMiner release 1.4.5-tpruvot using Compute 5.2 compiled binaries. This might not be the single best performing fork of ccminer available, however it is probably the one with most comprehensive support for various crypto algorithms (we tested with all of the supported ones) and with support for Compute 5.2. 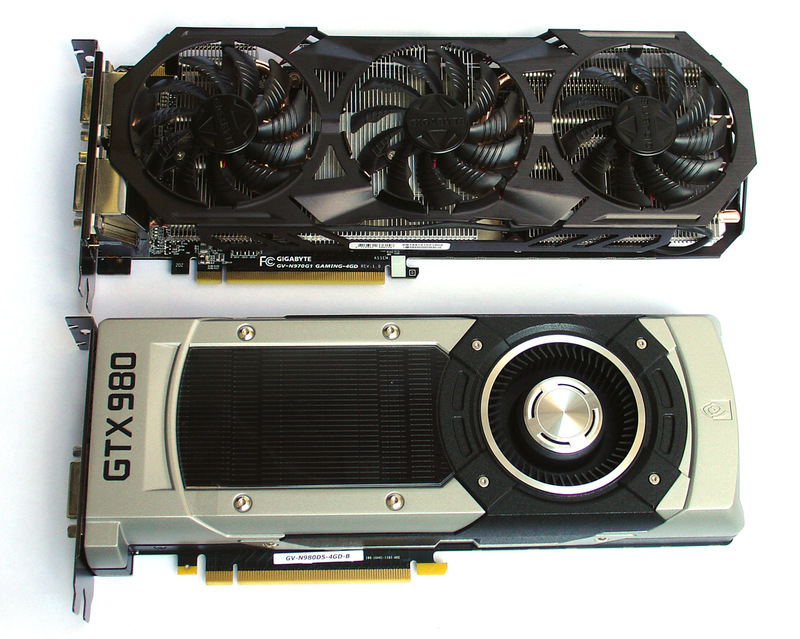 Some other forks might be able to provide slightly better hashrate on a specific algorithm, but the idea here was to do a comparison between a reference GTX 980 and a factory overclocked GTX 970 to see what you can expect in terms of performance. The results are pretty interesting as the factory clocked G1 card is getting very close to a stock GTX 980 and with some extra user overclock it might even achieve the same results. Considering the fact that the GTX 970 is still much better priced than the GTX 980 we can easily conclude that the GTX 970 and especially GTX 970 G1 Gaming from Gigabyte is a really good choice not only for gaming, but also for mining crypto currencies.